Sellers who don’t work well with agents are generally that way because they are extremely passionate about their opinions on their home. This passion can be an endless aggravation for you as the agent, or it can be a tremendous asset. Take a step back and really consider the emotional side. If it were your home, where you raised your kids, etc. how would you feel? It's a good idea to become the agent who is able to listen to their needs and fullfill their emotional concerns - something your competition failed to do. What pain point are they trying to solve? Which current "life stage" are they in and how can you get them to the next one? When you understand the above points, then you can start to focus on the bigger picture solution and have them stop dwelling on the present. Present them with solutions to gently push them into their next life stage; it could be downsizing, or an upgrade to a more convenient community, or better school district. Humans always need to see progression into the future, before letting go of the past. Let this be your guide into shifting their focus to what the future could hold for them, in terms of a change in lifestyle. When sellers disregard your advice, you might be tempted to point out your real estate experience in an effort to explain why their opinions are "wrong". In an attempt to prove them wrong, you will most likely come off as condescending, which will only escalate into an argument - or worse, getting fired from the listing. You need to align yourself with their pain to push through it, not against it. The entire act of being condescending, usually comes from a place of insecurity and fear of rejection. When you feel more secure, you are less likely to put others down. Here are 5 things you need to stop doing immediately. After you've exhausted all avenues of coming to terms with the seller's expectations and it seems as the negotiations are going nowhere, it's probably best to step away. Now this is not an easy thing to do..so you must prepare for it ahead of time. In preparation for any negotiation, have clearly definied boundaries that you simply cannot make an exception on. Maybe this is price, terms of the listing contract, whatever..
Just don't leave anything up to chance before you meet with the seller. This will allow you to have a clear exit strategy, should the seller not be willing to concede with your terms. When/if those lines are crossed, then it's time to walk away. Now, don't think that this is the end, because often times when you stand your ground, the seller will appreciate your negotiating skills (after all, you are being interviewed to perform a negotiation). You will be surprised at how many deals you walk away from actually come back to you later in your career - and often times on much favorable terms; i.e., on your terms. 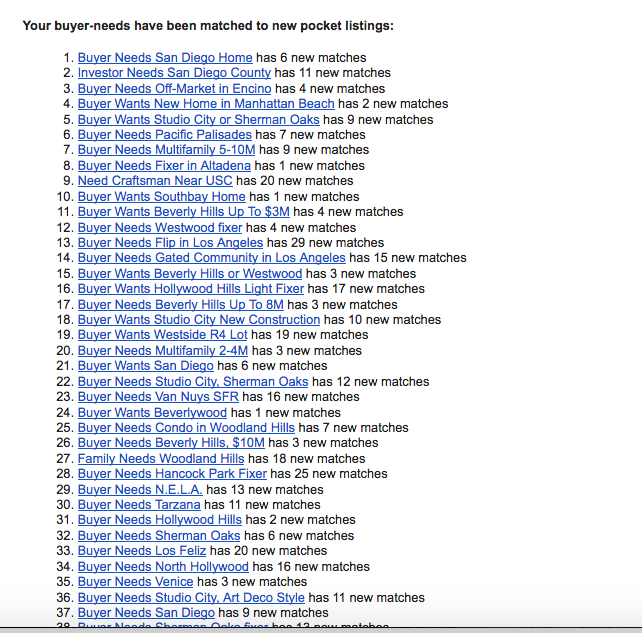 Our technology matches your buyer-needs with pocket listings and vice-versa - creating potential deals for you. You'll get email alerts like the following when matches are made. Will Robots Finally Replace Realtors? Is the traditional real estate agent, as we know them, fading away into oblivion?